August, Aldo Buzzi visits him in Amagansett. They have the first series of “conversations” which, transcribed and edited by Buzzi, will be published posthumously as Reflections and Shadows. ST talks about his early years in Bucharest and Milan, his impressions of America, and his art. Steinberg and Aldo Buzzi, Amagansett, summer 1974. Photo by Evelyn Hofer. © Estate of Evelyn Hofer. November, spends ten days in the Überlingen clinic, where he loses more than ten pounds. Visits his ailing sister Lica in Paris. 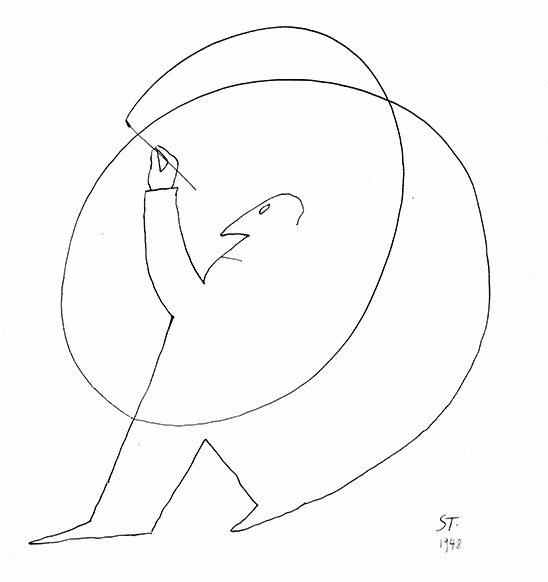 November 14-December 31, “Saul Steinberg: Zeichnungen, Aquarelle, Collagen, Gemälde, Reliefs,” at the Kölnischer Kunstverein. From Cologne, the show travels to Württemberg, Hannover, Graz, and Vienna (through August 1975). The organizers had wanted a full retrospective, but ST is adamant that the show focus on works of the last ten years.